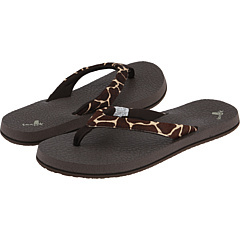 Join the native wildlife for an adventure of exotic fun with these Yoga Safari sandals in Giraffe print from Sanuk! Your feet will love the comfort of Yoga mat materials in the footbed, that make this one of the cushiest and squishiest sandals around. And the fun Giraffe animal print will definitely will keep you in style! Handmade upper for exotic and eye-catching style. Polyester liner for enhanced comfort. EVA out-sole with Happy U repeat logo tread. Sanuk has been around since July, 1997 when Jeff Kelley started making sandals out of inner tubes and indoor-outdoor carpet. While they’ve progressed into semi-proper footwear company, Jeff’s spirit of innovation still serves as the backbone of their little brand. Today, Sanuk strives to make products that are as much about funk as they are about function. They’ve found that sandals are happiest when they tread the road less traveled ? so Sanuk has design ’em accordingly. Because “Sanük” is the Thai word for happiness and balance, their name is also their mantra. Sanuk’s goal is to provide creatively inspired yet thoughtfully designed products for the global outdoor community… mostly because we’re all a part of it.